Free crochet sweater patterns for a childs cardigan and slip on sweater set. This set is a vintage pattern that is just as cute today as it was back than. This has a matching slip on sweater, you can find the link below. It will make a perfect addition to any toddlers wardrobe. "DAWN" INFANTS WOOL 5 ozs. Buttercup or color desired for Slip on. 6 ozs. for Cardigan. 1 oz. French or Baby Blue or any contrasting color for each sweater. 5 buttons for Cardigan. Directions are given for size 1. Size 2 is given in brackets. GAUGE: 2 patterns = 1 inch. 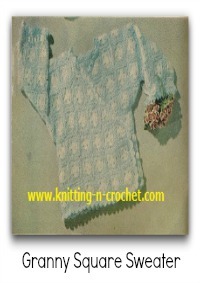 Ribbing: With Buttercup ch 15 (17), sc in 2nd st from hook, 1 sc in each remaining St of ch, ch 1, turn. 1st Row. 1 sc in each of next 2 sc, * 1 dc in each Of next 2 sc, 1 sc in each of next 2 sc, repeat from * across Row, turn. 2nd Row. Ch 3 (counts as 1 dc), dc in next sc, sc in each of next 2 dc, * 1 dc in each of next 2 sc (patter), repeat from * across Row, ch 1, turn. 3rd Row. * 1 sc in next 2 dc, 1 dc in each of next 2 sc, repeat from * across Row ending with sc in next dc, sc in 3rd St of end ch, turn. Repeat last 2 rows for pattern. Work even in pattern until back measures 8 1/2 (9) inches from beginning ending with 3rd Row of pattern. Next Row. Shape armhole: Sl st across next 3 sts, work in pattern to within last 3 sts, ch 1, turn. Work 1 Row in pattern. Next Row. Sl st into next St, work in pattern across Row to within last St (2 sts decreased), turn. Repeat last 2 rows twice. Work even in pattern until armhole measures 4 1/2 (5) inches from 1st decreasing point, ch 1, turn. Next 3 Rows. Sl st across next 6 sts, work in pattern across Row to within last 6 sts, turn. Ch 1 and sl st loosely across remaining sts for back of neck, cut yarn. With Buttercup, ch 15 (17) and work in ribbing for 5 1/2 (6 1/2 ) inches. Working, across long side, work 46 (50) sc across ribbing, ch 1, turn. Work even in pattern until front measures same as back to armhole, ch 1, turn. Next Row. Sl st across next 3 sts for armhole, begin -1 decrease 1 St at armhole edge every other Row 3 times. Work even in pattern until armhole measures 2 1/2 (3) inches from 1st decreasing point ending at neck edge. Next Row. Sl st across next 12 (14) sts, then decrease 1 st at neck edge every Row until 18 sts remain. Work even in pattern until armhole measures same as back armhole. Shape shoulder same as back shoulder. Work same as left front reversing the decreasing and shaping. Ch 13 (13). Work in ribbing until ribbing measures 6 1/2 (7) inches. Next Row. Working across long side, work 42 (46) sc across ribbing, ch 1, turn. Work in pattern increasing 1 St on each side every 5th Row until there are 60 (64) sts. Work even until sleeve measures 9 (9 1/2) inches from beginning. Next Row. Sl st across 3 sts, work across in pattern to within the last 3 sts, turn, then decrease 1 St on each side every Row until 18 sts remain. Sl st across last Row, cut yarn. Attach Buttercup at neck edge of left front and work 84 (92) sc down front, ch 1, turn and work in ribbing for 4 rows, cut yarn. Attach Buttercup at lower edge of right front and work 84 (92) sc up front, ch 1, turn. Work 1 Row in ribbing, ch 1, turn. Next Row. 1 sc in each of next 3 sc, * ch 2 for buttonhole, skip next 2 sc, 1 sc in each of the next 17 (19) sc, repeat from * 3 times, ch 2, skip next 2 sc, 1 sc in each remaining sc, ch 1, turn and work 1 sc in each sc, working 1 sc in each ch of buttonholes. Work 1 Row in ribbing, cut yarn. Block each section. Sew seams and sew sleeves in position. Sew buttons in position. With Buttercup, ch 10 and work in ribbing until band reaches from right front edge around neck edge to opposite front edge, cut yarn. Sew band in position. Cut 9 strands of Blue about 14 inches long, tie securely at one end. Divide into 3 strands and braid the entire length, tie securely. Work 2 more lengths in same manner. Tie each length into a bow and sew in position as illustrated.